Throw some light on the situation. This set of two lights feature a molded weatherproof housing with a 10" lead wire through back of housing. Ideal for roof or side mount. Steel mounting brackets, wiring kit, switch and all hardware are standard features. 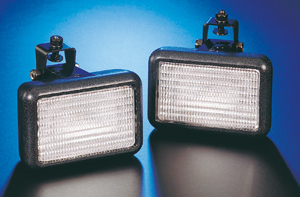 These lights are made for Curtis Cabs and provide excellent flood lighting for night time operation of equipment. They come with all the mounting cab hardware, lights(2), wire, inline fuse, fasteners and switch. It's a complete kit for the Curtis Cab.